Interested in using our Storytelling Adventure System format for your own chronicles? 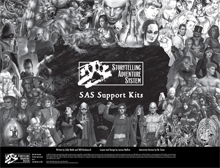 Then download this free SAS Support Kit. It has a few pages of suggestions on how to write stories in the SAS format (culled from the same document that White Wolf freelancers get to write our professional SAS stories), and dozens of sheets and forms for you to print up and fill out, covering all of the World of Darkness lines, as well as Exalted and Scion. This is our interactive version with fillable PDF fields. You can find our standard version here. Note: As of August 21, 2009, this file has been updated to include sheets and forms for Geist: The Sin-Eaters. This title was added to our catalog on June 08, 2009.